Jakarta, December 18th 2014 â€“ With Sumatra becoming an ever-popular destination for both business and leisure travel, Archipelago International made a favehotel debut on the flourishing island with the opening of favehotel Palembang on 15 December, 2014; the latest favehotel location that will cater to Pelembang's growing demand for budget business hotels. favehotel Palembang boasts a strategic location half way between the Sultan Mahmud Badarudin Airport and Palembangâ€™s Central Business District. Its close proximity to the Palembang Trade Center Mall further makes favehotel Palembang an ideal base for business and leisure travelers alike. The wide range of business facilities include the hotel's swimming pool for adults and kids, Gym, Wellness Spa, ample parking space, 6 modern meeting rooms and ballroom for training, workshops, product launches, exhibitions and other social events, as well as truly high-speed WiFi throughout the entire hotel, making this â€œfaveâ€ the best in class amongst the area's economy hotels. 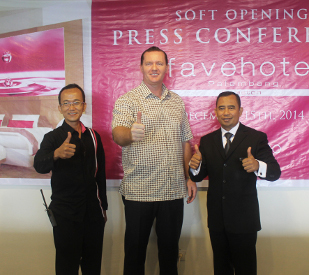 â€œWe have been keen to introduce our favehotel brand to Sumatra for some time, so we are delighted to be opening favehotel Palembang this December at a time when affordable business hotels are in high demand. We hope that with our presence, Palembangâ€™s MICE market will continue to grow, establishing Sumatra as the next best destination for Indonesiaâ€™s business travelers.â€ Said John Flood, Archipelago International's President & CEO. Archipelago International hotels operate under the hotel brands Grand Aston, Aston, Aston City, Alana, Harper, Quest, Quest Vibe, favehotels, NEO and Kamuela, ranging from ultra luxurious private pool villas to serviced apartments and select service economy class hotels, thus offering Indonesiaâ€™s vastest and most comprehensive hotel network.